Birthday shows for children are always popular as a means of paid entertainment for the kids. It saves the mums and dads having to organize things for kids parties and to concentrate more on enjoying themselves as well. For many people the cost of outsourcing entertainers makes good sense. You see, childrens birthdays are always full of anticipation. And of all the party show entertainment people can enjoy, it is unlikely that anything can match a wilidlife display in your own home. Children's parties are not easy to get right the first time, but when you get the mobile reptile show or wildlife display to come to your place, most of the entertainment is sorted. The animal handler usually comes at the beginning of the event and takes little if any time to get ready to begin to entertain the kids. The animals come out of the boxes or crates and are usually talked about before beging passed around in a secure and stable environment. As a rule at a good reptile party show, the kids will be able to hold the animals and without any serious safety risk. While animal bites may happen, these are not common and if they do happen the usual result is little more than a scream and a bit of blood spotting. That in itself is not a rare event at a noisy kids party, where kids going through windows and bashing one another up are common fare. As snakes are deaf, no amount of noise will spook them out and for what it's worth lizards don't seem to be fazed by excessive amounts of noise either. Crocodiles, alligators, birds, Kangaroos, Koalas and possums are another story however and they generally like it to be very quiet and really don't like people most of the time. With this in mind, what critters and other animals you get in should be determined by the level of noise you think will be around on the dayt. There is a variety of options available, ranging from boring static displays with animals in cages, hands off reptile shows, best described as the show and tell style of performance and then the real deal in a hands on reptile incursion that will blow your mind out. In all of Melbourne and the rest of Victoria, only one group does the latter kind of show, as in the hands on ones, so it pays to look around before spending up on the reptile display. As a word of warning, they are a bit more expensive than jumping castles and the like and so you may wish to check pricing as well. Some outfits charge per head and can be very expensive if you have a large goup of people at the party, whereas a few others are casual on numbers and charge a flat party rate per show, event or holiday school incursions. Then there is the issue of location. Melbourne-based outfits charge much the same rate anywhere in the city and suburbs, whereas others charge travel rates and this makes prices widely variable and depending on where you are located. For example if you live in Mornington or the Latrobe Valley, you may find a local company can do a reptile show for a lot less than someone from Melbourne's east. Across the state you will find someone ready willing and able to come to your place to do a wildlife show and likewise for a greater variety of choice in kids shows for a show at a birthday party. 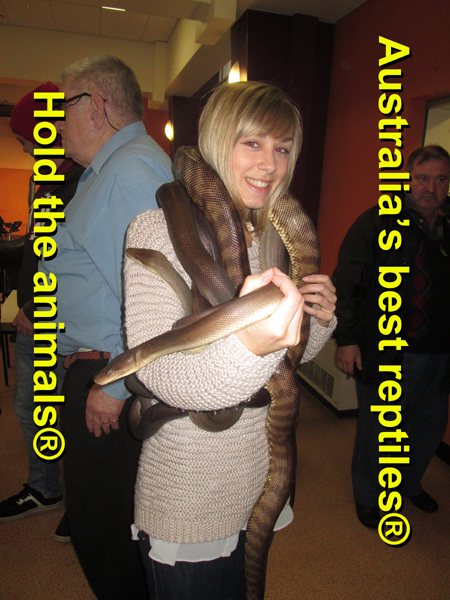 Events will always be exciting with reptiles and guests will always remember the event. However if you are in a bush place a long way from the city, it may be prohibitively expensive. As for locations and venues, these kinds of shows can be done indoors or out, but the general preference is inside or at least out of the vagaries of the weather, such in a gazebo or similar. There is nothing worse than a reptile party outdoors and in the wind and rain. However it's worth remembering that if the weather is nice and the temperature is mild and it's not too hot, under a shady tree in the garden is a perfectly reasonable place to do a reptile show for kids parties. Also it's worth noting that some kinds of food and chemical disinfectants may be toxic to wildlife. Hence itis usually best to do the show before you feed the kids. This is not a mandatory situation, but rather one that the circu,mstances dictate. If in doubt, as questions before the handler arrives and as a rule, all will run trouble free. Melbourne kids birthday party has the best advice for Kids reptile parties and childrens party shows in Victoria. Copyright 2014 Melbourne Kids Birthday Party. All rights are reserved and trademarks also registered.